Dates ladoo or Khajoor ke ladoo is sugar free, fibrous and very healthy dessert recipe. Quick to make Indian dessert recipe. Best part is that these ladoos are sugar free so even diabetic people can have these ladoos. Additionally dates are full of fibers so these ladoos are a good way to add fibers to your daily diet. 1. Heat a kadai, add dates, milk and cream. Cook the mixture till dates get soft and dries up nicely. 2. Cook on medium flame for at least 30 minutes. Keep on stirring in between and add more milk if mixture gets too dry. 3. Once mixture is dried up, switch off the flame and keep aside to cool down. 4. Add chopped walnuts to the date mixture and make small balls to prepare ladoos in desired size. 5. Roll the ladoos nicely to give a nice glaze. 6. 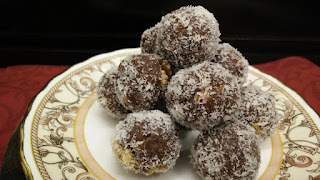 Coat all date ladoos in the desiccated coconut mixture. 7. Healthy sugar free ladoos are ready to serve.